Supermarkets are large and busy and the chances of having an accident whilst using one are bigger than many people may think. It is not uncommon for people to have accidents whilst using a supermarket, the most common cause being through slipping on a wet or soiled floor or tripping on unsupervised equipment or spilled products. Because shopping is such an everyday and personal experience, many who experience an accident while doing it are thrown by the experience and are unsure as to what to do. Apart from any physical pain involved, many people experience embarrassment at having an accident. Supermarkets are busy places, and nobody wants to be seen in an unbecoming position or as having made a mistake. This often leads to victims just wanting to get up and get away from the scene of the accident as quickly as possible. There is also the shock involved for people to deal with and this often means people who have had an accident do not think about what they should be doing straight away. This can mean that their future interests may be compromised, for example if they are seriously enough injured to be able to make a claim for compensation. It is worth remembering that supermarkets have a legal duty to ensure that they keep their customers safe whilst they are shopping. It is very common for injuries to take some time to become fully known. What seems trivial on the day of the accident can mean immobility the next. It is therefore very important that some basic action is taken at the time of the accident as it will be difficult to immediately assess the longer term impact of an accident. The first thing to consider is whether first aid is required. All supermarkets should have a qualified first aider on the premises so ask that they carry out an immediate assessment and if necessary call an ambulance. It is important to take the details of any staff members, First Aider included, who saw what happened or who helped in any way. Take the details of any other members of the public who saw the accident. They could prove valuable as witnesses if you take legal action as a result of your accident. All supermarkets are required to keep an Accident Book in which details of accidents are clearly recorded. Ask that this be done immediately. Make your own notes of what happened as soon as possible. If your phone can do so, take photographs of the area in which the accident occurred, any obstructions, spillages, wet floor, cleaning equipment or anything else that may have contributed to your having an accident. If you can’t do that yourself ask if a witness can do it for you. Also ask if there is CCTV in operation, and if so request footage of your accident. If you don’t do this immediately do so as soon as you can. Hopefully your injury will not be severe, but if you see any medical staff after you have left the scene of the accident keep a record of who, where and when. 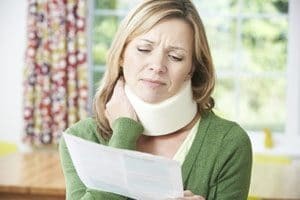 If you think you may be entitled to claim compensation as a result of your accident, seek legal advice as soon as possible. Many solicitors will offer advice free of charge and can clearly indicate whether you have a claim. Funding the claim will also be discussed, including ‘No win, no fee’ options. This entry was posted in Personal Injury on 10th February 2017 by pinnacleadmin.